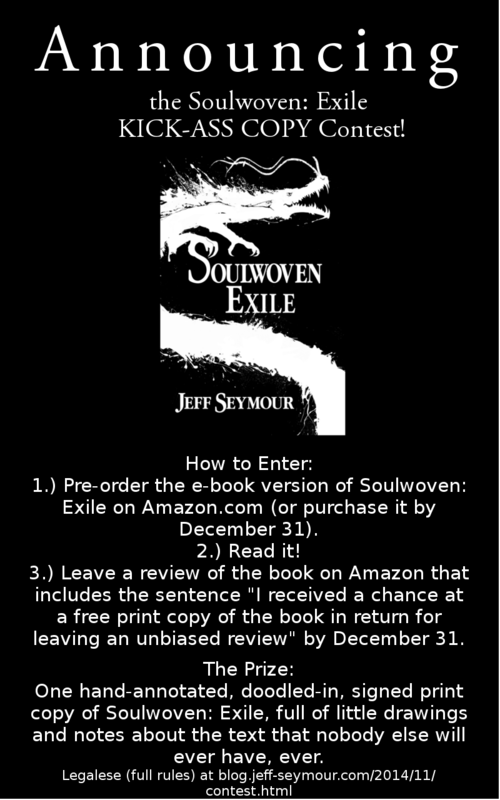 As I think most of you know, I posted the first chapter of Soulwoven on Wattpad this week. Part of that process involved some significant monkeying around with the placeholder cover image I generated for it, but the blog post on putting a chapter up had gotten long enough that I thought I'd post separately about the cover. Eventually, I hope to have someone from the Wattpad community do me a snazzy, proper cover. There are a lot of forum threads in which people volunteer to make book covers for others, and they're pretty amazing. Which uploaded easily as a .gif (when I tried to upload the original bitmap, it just didn't work--no error message, no explanation. The cover just didn't change). I went with a .gif rather than a .jpg because the colors washed out less. Unfortunately, once uploaded to Wattpad, something terrible happens to your cover image. It gets all blurry and lossy and just generally gross. I made several unsuccessful attempts to fix this, and it seems to have happened to many more covers than just mine. We have the same problems.....did you fixed yours now?? ?